Rumsfeld: "Somebody might know somebody who knows where Bin Laden is"
The top target of the US war on terror isn't usually the subject of pillow talk - except for the defence secretary. Donald Rumsfeld has admitted that his wife often needles him about the whereabouts of Osama Bin Laden - often just after they wake up. "When I walk out of the bedroom in the morning, my wife frequently rolls over and says, 'Where's UBL?'" he said, referring to the spelling "Usama". 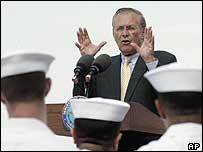 Mr Rumsfeld insisted the search for Bin Laden was as concentrated as ever. Speaking to sailors and marines aboard the USS Essex in Singapore, Mr Rumsfeld did not reveal how he responds to his wife's teaser. But in characteristically colourful form, he admitted the whereabouts of Bin Laden - who has topped Washington's most-wanted list since his apparent masterminding of the 11 September attacks - remained a mystery. "Close doesn't count," he said, according to AP news agency. "In [throwing] horse shoes, yes, in finding a terrorist person, no. There are a lot of people looking. If he's alive and well out there, he is very busy trying to avoid being caught. "He is under pressure, but where he is, we don't know. If we knew, we would go find him. [But] until he's caught, he's not caught." Mr Rumsfeld - who has also acquired a certain notoriety for his verbal convolutions - also explained that he believed Bin Laden would probably turn up suddenly after a tip-off, as in the case of Saddam Hussein. "The only way we ever found him is finally somebody put enough pressure on enough people to find out that somebody had an idea where somebody might know somebody who might know somebody who would know where he might have been," he said, according to the American Forces Press Service. But he said people were "working their heads off" trying to track Bin Laden down.